What a blast! LG managed a gorgeous booth on a high-traffic corner (a customer came by and said, “I knew I would find you with lots of plants!”). We enjoyed nearly constant conversation with lots of GF visitors and fellow exhibitors, many with hybrids or hybrid friends. The best was all the positive energy and support for our business. The event truly marked our graduation from start-up to operation. What an acheivement! I left Sunday evening absolutely exhausted but wholly excited for the weeks to come. We look forward to connecting with many more environmentalists, in SF and beyond. Kudos to the Green Festival producers Global Exchange and Co-op America for a rewarding, successful event. My thanks to Robb Protheroe of Plug-In Supply for displaying his Prius plug-in kit (the celebrity of our booth), for helping promote us to the many interested festi-goers, and for breaking down our exhibit in record time. The success of the event was handsomely boosted with his participation. Thanks also to Plug-In America and the San Francisco Electric Vehicle Association for their support of plug-in hybrid technology and sending interested parties our way. Sherry Boschert, president of both organizations, managed an ad-hoc audio interview with both Robb and me in the middle of the event. Be sure I will post it here once it goes up. We also made several important and interesting connections with BEV owners and retailers that we look forward to serving at our shop. The Prius+ kit and corresponding attention would not have been possible without the famous Calcars and their generous support and encouragement. We are so fortunate to work with them. A luscious thank you to Amy Waldman, Hillary Lyon, Anca Mosoiu, Greg Simon, Chuck Protheroe, Paz Perry, and Amy Hofer for helping in the booth and promoting us to the throngs of over-stimulated passers-by. We could not have survived without you!!! Big LG love to SF Green Cab‘s Thomas George-Williams, Mark, and Rua for also manning our booth and hanging their terrific poster. It was a sincere pleasure seeing their cards out on our table. 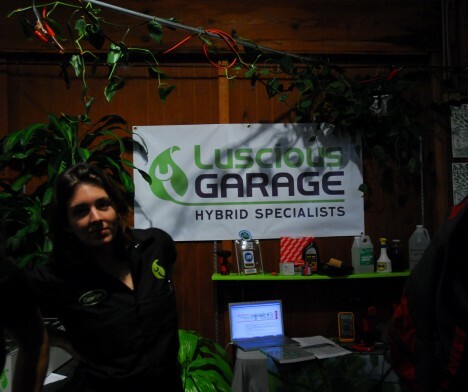 Most of all, thank you to all the people who took the time to pause at our display, pick up a postcard, chat with one of us, and discover the many things we have going at Luscious Garage. We were proud to be the only auto service business in attendance (though Art Ratner from Art’s Automotive did stop by) and one of the few businesses in the transportation sector. There is so much to do towards improving our environmental and public health, and we look forward to working together in that mission. ← LG and HG streaming live!